4. Aluminum with good heat dissipation. EASY INSTALLATION & UPGRADE - Preinstalled hook and hanging loop allow for a easy and fast installation. Simply hang the UFO High Bay via the included ring attachment in the desired location. WIDE APPLICATION - LED high bay is perfect for factory, warehouse, workshop, garage, backyard, supermarket, exhibition hall, stadiums and more. Also, the IP65 approved UFO high bay lights and optional accessories can be used in outdoor and indoor. The optional mounting bracket allows you to angle it to any angle. HIGH QUALITY - Die-cast aluminum pure metal body has an impact-resistant, polycarbonate lens, which protects the LEDs from water, dust, and debris. SUPER BRIGHT & HIGH PERFORMANCE - That is a staggering LED Efficiency of 133lm/w! Also, this UFO high bay has a 120 degree beam angle, which can be reduced to 90 degrees with the optional reflector. We have own designer, and we offer OEM&ODM service too. 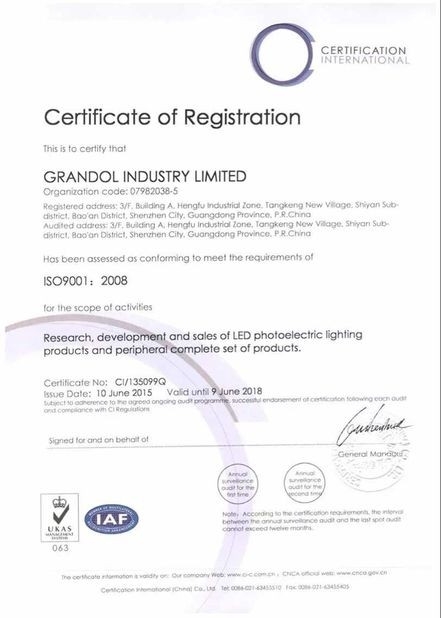 Grandol have a strict quality control system, we select the best quality raw material for our product such as SMD LED chips,driver.Every product have 8 to 24 hours aging test before shipped. We are led lights manufacturer from China. All the price are wholesale price. Our target is producing high quality goods as well as best price to benefit our comsumers.